Well this is the season always make me think of hot spicy curry. Is winter now in down side of the earth. It still occurred to me having winter in the mid year make us all here so special . While other side of the earth is having beautiful spring, summer cozy warm environment, ours is cold , dry and slow is just so different . 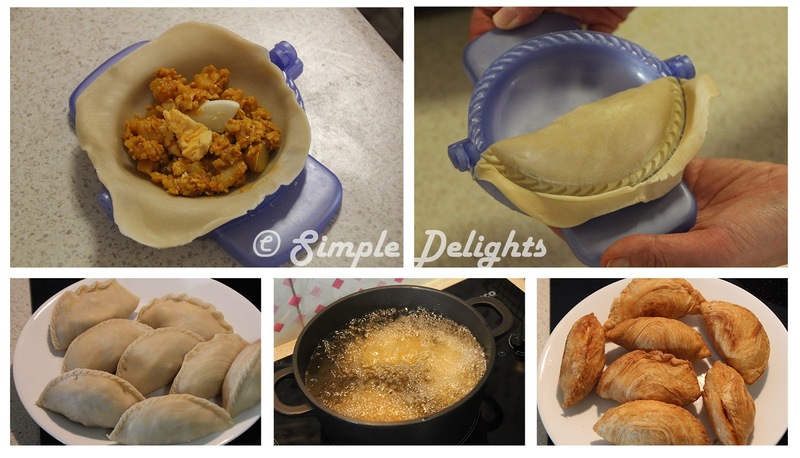 The curry thought bring up this idea of making some special Malaysia snack and it has been awhile I have an authentic curry puff in Australia. Instead of waiting to find a right stall why not make some for myself and friends =) Yup we have another steamboat night to celebrate Rice Dumpling festival and everyone take home a curry puff as snack/breakfast for the next day . I also submitting this post to Little Thumbs Up event hosted by Miss B of Everybody Eats Well in Flanders at this link, organized by Zoe of Bake for Happy Kids and Doreen of my little favourite D.I.Y. 2. Put the potatoes in a microwave container sprinkle some salt , pour enough water to cover it and boil in microwave for about 15min. This step help to prevent potatoes undercook during the stir fried process. 4. Pour in the cooked potatoes to the curry chicken mixture continue to combine the potatoes with into the curry chicken . 5. Put in the chili powder, soya sauce and salt. Taste to seasoning to your liking. 6. Once the chicken mince is cooked , off the fire and leave it aside to cool. If the curry is too dry you can add some water in the wok when putting the potatoes . 1.Flatten the water dough and wrap the oil dough inside. Pinch and seal the edge nicely. 2. Dust some flour on your work surface, gently roll the dough into a rectangle. 3. Fold the rectangle from one long end by 1/3 and fold the other long end over the top. 5.Once the dough has been rolled and folded 3 times, slowly roll up tightly into a swissroll and rest for 20min. 6. Use a knife, divide the dough according to the size you are making . For my curry puff mould it make about 24 pc for this measurement. A picture speak thousand word do go to the link and see how this process is done. I learnt something from this rolling process, the dough has to be rough quite tightly into a swissroll shape, if is not firmly roll up , when you roll it out to a small disc the spiral style in the middle might break off easily . 1.Take a small dough (spiral side face up) , used a small rolling pin to roll to a circle disc. 3.Put 1 tbsp of curry chicken filling in and place a slice of hard boil egg. 4.Fold in the mould and here you have a beautiful curry puff. Make sure the edge is tightly seal. If not once it place in a hot oil, it will open up. Once the curry puffs has been made , heat up the oil . The oil has to be really hot and place curry puff into it . Deep fried till golden color. Need me to say more, it was so crispy and yummy. All my friends love it. The response is so good I make another batch of 80 pc and sold to those who love what I have make. Result is well responsed and is so encouraging for my 1st food business venture out . Appreciate all the support from my friends , it was such an encouraging experience. Hope to be friends via blogging :D I'm now your latest follower and hope to hear from you soon. Love the Culture and historical building in Melbourne. Hope to visit that city soon again . Is full of desserts place , beautiful café and good food ^^Is just dry cold down in BNE here not my kind of weather. Yup is great to know friend through food blogging. Thanks for organising this event I always learn a lot from all other blogger. Love the effort you put in your blog, to have pic and wording and step on the pic is an extra effort. Have a good week ahead , hope Melbourne this weekend is not wet and dry like down here .